I have serious Spring Fever. I’m not sure where it came from or how and when I was infected, but it has suddenly hit me full force. It’s not that we here in the Northeast had suffered through a particularly bad winter – certainly nothing like the winter of 2014-15 – but brutal or no, it overstayed its welcome. Our “spring”, thus far, has been dreary, cold and wet. This week, however, all that will change in a big way. While the trees are finally – FINALLY – leafing, flowers are blooming and the grass is greening, we are going to get a week of glorious spring weather. And though it’s only Monday in my work-a-day world, I’m already trying to think of ways I can sneak away and enjoy it. merry play; merriment; gaiety; fun. playful behavior or action; prank. verb (used without object), frolicked, frolicking. to have fun; engage in merrymaking; play merry pranks. After a lot of self-examination (I endeavor to make Socrates* proud), I’ve come to the conclusion that there has not been nearly enough frolicking in my life. This needs to change. Life is too short to take too seriously. We are constantly being exhorted to “dance like no one is watching”. Why can’t I take this a step further and roll around in the grass of the Public Garden if I want to? 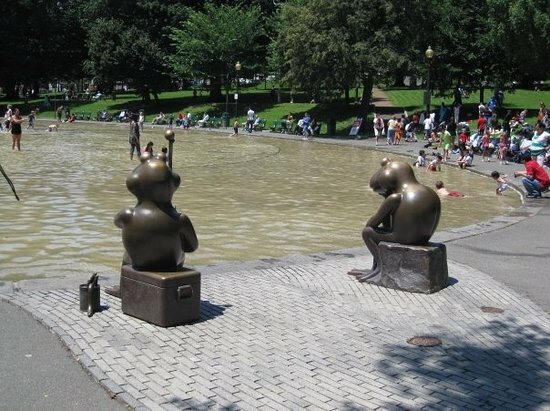 I should be able to splash my way through the Frog Pond or sit in the rope swing of the park across the street from my apartment without feeling anything but the unabashed joy that should accompany the realization that I can. Of course this requires that I walk the walk and not just talk the talk. I’ll have to remember to take my allergy medicine. I’ll probably have to engage in some creative subterfuge to get away from the office (since Commencement is a mere two weeks away) and I imagine that a trip to the swing set will be easier for me to manage than actually rolling around on the grass (I’ll save that for the rolling hills of White Oaks *wink wink*), but I will absolutely take my shoes off and curl my toes in it. And how do you plan to celebrate spring, or the week or even a new day? Any frolicking in your future? My Spring frolic is getting in the dirt, sun kissed shoulders and yes the occasional lie in the grass – it is therapeutic! The accompanying sound clip put me in the mood. To frolic. I am more than ready for better weather, Or t least consistent weather. 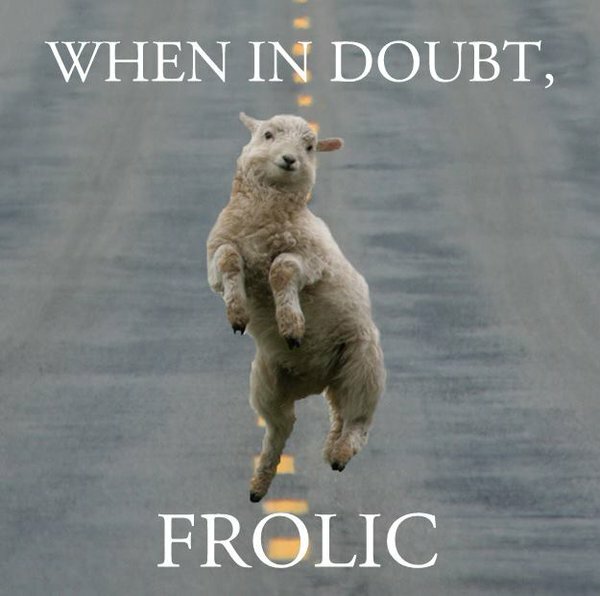 Leave a reply on "When In Doubt, Frolic"